Now, this is an application that many of you have probably been waiting for!! I personally use IntelliScreen for my status bar notifications but, if you do not use IntelliScreen…this is perfect for you! 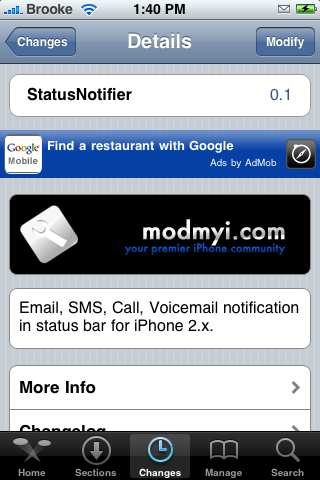 StatusNotifier adds an icon to your status bar (the bar at the top of your iPhone with the carrier logo on it) if you have a missed email, text, call or voicemail. This is very similar to the Taskbar Notifier application for firmware 1.1.4 and below.